Goulston & Storrs is pleased to announce that Suma V. Nair, a Director in the firm’s Private Client Group, is the recipient of two new professional distinctions. She has been elected as a Fellow of the American College of Trust and Estate Counsel (ACTEC), and has been chosen as a member of The Boston Foundation’s Professional Advisors Committee. According to its website, The American College of Trust and Estate Counsel is a nonprofit association of lawyers and law professors established in 1949. Its 2,700 Fellows are elected to the College by their peers in recognition of having the highest level of integrity, commitment to the profession, competence and experience as trust and estate counselors. All ACTEC Fellows have made substantial contributions to the field of trusts and estates law through writing, teaching and bar leadership activities. Suma joins five other Directors at Goulston & Storrs who are also among the highly selective group of ACTEC Fellows. The Boston Foundation, according to its website, is one of the largest community foundations in the nation, with net assets of some $1 billion. In 2015, the Foundation and its donors made more than $110 million in grants to nonprofit organizations and received gifts of approximately $120 million. The Foundation is a partner in philanthropy, with nearly 1,000 separate charitable funds established by donors either for the general benefit of the community or for special purposes. The Boston Foundation also serves as a major civic leader, provider of information, convener and sponsor of special initiatives that address the region’s most serious challenges. Its Professional Advisors Committee counsels The Boston Foundation as it establishes, develops and maintains strong working relationships with the members of Greater Boston’s advisor community. Additionally, the Committee provides its members with opportunities to exchange charitable giving ideas, learn about new issues in philanthropy and establish new relationships with other advisors. 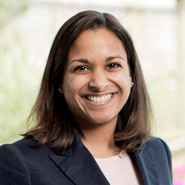 In her legal practice, Suma provides sophisticated estate and tax planning advice for high net worth individuals. She counsels clients regarding charitable giving, and advises generally on family and tax matters involving business and wealth succession. Additionally, Suma represents professional and family fiduciaries in connection with estate and trust administration. She has held various leadership positions with the Boston Bar Association, having most recently on the Council and Executive Committee, and has served on various non-profit boards and advisory committees, including for the ACLU, On the Rise and Birthday Wishes.